I love Halloween almost as much as I love Christmas . . . our mom always made it such a fun holiday. Each year, we had multiple Halloween parties: school, family, and a big party with friends. 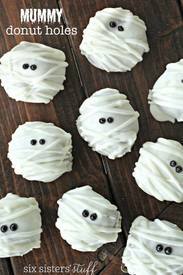 Our mom always made fun treats for the party that were festive and cute. Sometimes the simplest desserts are the best ones – you don’t need to spend all day in the kitchen with this recipe! These little donut holes are perfect for class parties or to give to neighbors (maybe even give them as the Neighborhood Phantom! ).